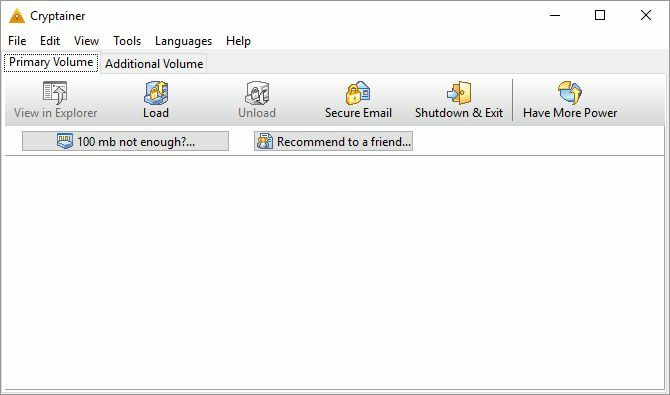 Cryptainer-LE is a 448bit free encryption software utility that can create an encrypted disk drive to store data safely. It creates an encrypted disk drive (volume) to store any type of data. It's powerful 448 bit encryption, creates multiple 100 MB encrypted drives (vaults) on your hard disk. These encrypted disk drives can be loaded and unloaded when needed. To get around the 100MB limitation, you will need to buy a paid version of the software instead.